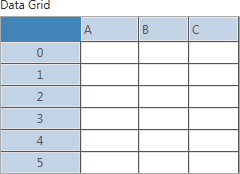 Group elements of various data types as rows on a table. The data grid control is a 1D array of clusters. Each row of the table is one cluster, and each element in a cluster represents one column. You can use the data grid control to configure hardware or to display data in a table.